In mid-October I had the opportunity to go to an event hosted by Engineering for Change (E4C) in New York called Impact Engineered. Even though it wasn’t a regular part of the E4C fellowship that I did over the summer, it was a great way to wrap up the experience with them. Impact Engineered was a half-day event that brought together mechanical engineers, policy-makers, and global development practitioners across multiple sectors, to share and celebrate work that is happening in the domain of technology for development around the world. The event was also partnered with an event for the ISHOW (Innovation Showcase) finalists. The E4C fellows were invited to come a day early to help interview the finalists to see if their products would be appropriate for inclusion in the E4C Solutions Library database. It was a great opportunity to meet the finalists from India, Africa, and the USA, who have designed products that have the potential to alleviate poverty. The innovations included (in India) a compact sanitary pad making machine, a neonatal breathing device, a braille reading and writing tool, (in Africa) a malaria diagnostic tool, a science set, a sign-language to speech translation glove, (in the US) a clean cookstove, a portable eyeglass prescription device, and a low-cost mobile refrigerator. That evening we had an informal dinner so that we had a chance to continue talking and networking. The Impact Engineered event was held the next day at the Centre for Social Innovation. It didn’t start until the afternoon and so Grace, a fellow E4C researcher, and I decided to work a bit at a cafe in the morning and then walk across town to get there. I introduced Grace to the Highline which was very close by to the venue and saw the Zaha building almost complete and the Shed still under construction. The Centre for Social Innovation is located in an old industrial building that had been transformed into a creative and flexible work and event space. There were options to participate in a main group of presentations or break off into smaller workshops depending on our interest. Themes included discussing how to enable an ecosystem for social impact, what engineering for 2050 might look like, and case studies of different solutions being implemented around the world. After the sessions there was an awards ceremony and a reception. I met many interesting people including a few designers and construction material experts who I interviewed during my research fellowship! It was also nice to spend more time with the other E4C fellows who attended. After the event we were pretty fatigued, but hungry, and so Grace and I went to a bar around the corner from our hotel where we had a good meal, shots on the house, and I learned that in the US they call mixed drinks with the cheapest liquor “well drinks”. The following morning I headed home already and by the afternoon was back at work! I was super excited in mid-August to go on a fourth hiking/camping trip to the Adirondacks, this time with Rachel and Vikkie and three of their friends who I didn’t know well at the time, but got to know better: Mauri, Jason, and Ryan. My job and research fellowship were keeping me very busy up to the day of departure, and I actually made the mistake of thinking that the trip was from the Saturday until the Monday but then on Thursday near the end of the workday I realised that it was in fact Friday to Sunday. I don’t think I ever packed that quickly before but luckily I am familiar with what items to bring camping. I am also fortunate to have a flexible job since I had asked for the wrong day off! Rachel didn’t want to get stuck in traffic picking me up somewhere off of the TTC, and there was no certainty that I would be able to catch the first bus going to Unionville from Union Station. So Rachel and Vikkie came to pick me up from my house…. at 11:30pm. They are such amazing friends! We didn’t get to bed until after 1am and so would be running on 5 hours of sleep. The next day we were on the road by 8ish. We were a bit delayed because we couldn’t get the cargo container closed because we had tried to fit too many things into it. The drive was smooth. It started raining when we stopped in Lake Placid to get groceries, but we were lucky that the showers were local and that Wilmington had stayed dry. We set up camp and then drove around, and after stopping at a very abandoned santa’s workshop and a closed High Falls Gorge (that charged money anyways), we eventually found a place where we could walk down to the river and see a small waterfall.The others enjoyed getting to the middle of the river by climbing across some logs and jumping rocks, but I was tired so I just sat on a rock by the shore and watched them. Back at camp we made chicken fajitas and had a beautiful fire. I treated everyone to Saranac beers, although because I was so tired I ended up with a mean headache. We woke up at 6 and after breakfast and lunch prep we were on the road by 8. I was eager for us to leave early because I was worried we might have trouble finding parking. We went to a place called the Garden in Keene Valley and got lucky because we got there just as a group that had returned from an overnight trip were leaving. Otherwise we would have had to drive back, park at the airfield, and take the shuttle. We hiked Big Slide via the Brothers and it was a beautiful ascent! The Brothers offered views from several ridges that kept us wondering if we were almost at Big Slide. It was further than we thought (as always is the case), but the final reveal was stunning! Near the top there was a glimpse of the big slide that gave the peak it’s name. We decided to make a loop and descend towards John Brooks Lodge instead of going back the way we came. Even though the route was longer, we would get to explore more of the unknown, have the final few kilometers on fairly flat ground, and check out what this John Brooks Lodge place was like. It was helpful that we stopped at Johns Brooks lodge because several of us were getting short on water and they had a tap where we could fill up. The lodge seemed like a great place and I think I want to stay there some time! It is similar to a hostel and during the high season it costs more ($70-80 in high season, $30-40 in low season), but they provide breakfast and dinner and a packed lunch for day trips! From the lodge we followed along the valley back to the Garden. We were all pretty tired by that point, but we kept our spirits up by singing random songs. I was thankful that we all made it back safely. 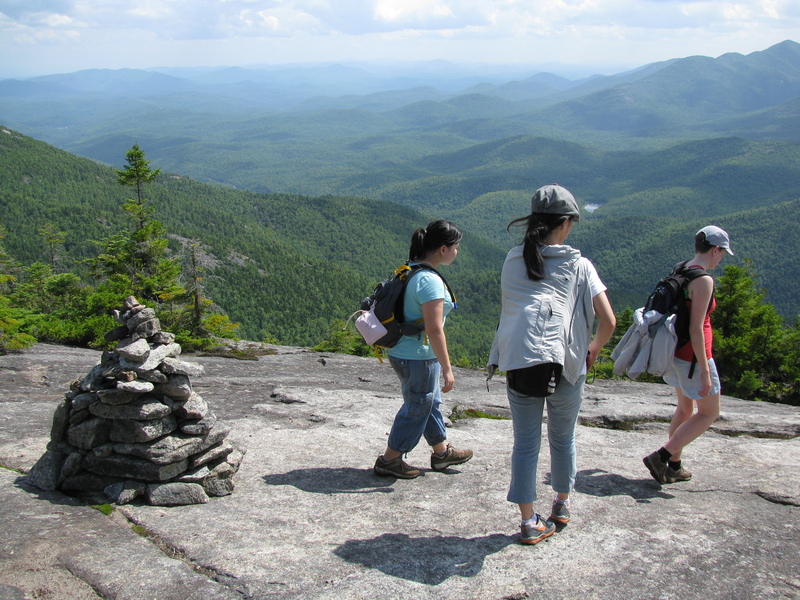 I always feel a little protective of a group when I am introducing them to hiking in the Adirondacks for the first time! It is important to choose a route that is exciting and challenging, but also not too difficult. On our drive back, Rachel was determined to find a swimming spot. I didn’t really care either way, but in the end I was glad because we had a great time. She pulled into a little parking area on the Ausable River across from the airfield in Keene that had picnic tables and a shallow area where people could wade. I watched for a while as the others went in, and finally decided to go in too but with my sandals because it was so rocky. There was a line of larger boulders where the water flowed over and you could get a foot massage. We found out that the area on the other side of that small water fall was better for swimming because it was deeper and surprisingly went up to our shoulders. Vikkie had an underwater camera and so we then proceeded to try and take group pictures and selfies under the water! We decided that we would eat out in Lake Placid that evening. Rachel wanted to go to a place called Smoke Signals, but they were full up with a two hour waiting list, and so instead we want to a place I had been recommended called the Cottage. We got a seat on the patio which overlooked Mirror Lake. The atmosphere was nice but the food was only okay. You would think we would be tired by this point, but the guys were determined to have smores! So we went to the grocery store to pick up supplies! The next day we packed up camp and I decided to take us to hike Little and Big Crow which would be nice and short but still promised nice views of the High Peaks in the distance. Again we had some trouble finding the trailhead, but eventually took a small road we thought would lead us there. It brought us to a small parking area that had a trail going directly to Big Crow, instead of the one that involved a loop as I had originally planned. In the end it was better because we had more time to relax and enjoy the scenery. At the top we met a man who was very familiar with the peaks and was able to point out Mount Marcy (the tallest peak), Big Slide (the peak we had hiked the day earlier), and Giant Mountain (one of the peaks we hiked two years ago). We decided not to hike to Little Crow so that we would have more time for lunch. We planned to have a picnic to finish up all of our leftover food. Since we couldn’t think of another place to go, and because we weren’t that far anyways, we returned to the swimming spot in Keene Valley. On our way there a truck in front of us lost a skid from the back, and I thank God that we had enough space to move around it and not hit it! We soon forgot about that event because in the airfield across from the swimming spot there was a Sunday market going on. We decided to stop there and check it out. Then we went back to our swimming spot that was full of people this time. We claimed a picnic table and enjoyed our leftovers. From there we hit the road back home. The trip felt far too short, but any chance to get into nature (and mountains) is worthwhile. I am thankful that despite being so busy I was able to enjoy these moments in nature with friends! The next time I go to the Adirondacks I plan to do back-country camping! This spring I applied and was accepted for a part-time summer research fellowship with an organization called Engineering For Change (E4C). It is an exciting opportunity as the role involves researching poverty-alleviating products and services being implemented around the world in the housing sector. The information that I research will be added to a growing solutions library that is available to the public. The fellowship runs from mid-May to mid-September, and on the May long weekend I went on a trip to New York City for the kick-off session. While I represent the housing sector, there are eight other engineering researchers representing the other target sectors of energy, sanitation, ICT (information computation technology), agriculture, transportation, water, and health. The kick-off session was on May 19th (my birthday! ), and so I took the Thursday until the Monday off of work so that I could attend the session and then enjoy some time exploring the city. I also decided to take the opportunity to make a quick stop in Boston by arranging to fly back from Boston instead of New York. Since I am horrible at planning trips on my own, this was the perfect motivation for a short holiday! I flew out of the Island airport which was a fairly stress-free experience even though my flight was delayed. The more complicated bit was figuring out the bus to get into Manhattan and then the bus was stuck in traffic for quite a while (I found out later I could have taken the train!). I arrived in the city pretty exhausted at around 9pm. I had dinner on my own at the hotel and then went to bed early! The next day I made the short walk around the corner to 2 Park Avenue where the ASME offices are located. Everybody slowly filtered in and we enjoyed a light breakfast while we introduced ourselves. The morning was an introduction to the program and its purpose and objectives, and the afternoon went deeper into the standards for the research itself. I appreciated E4C’s clear desire to go the extra length to collect high quality data. At the end of the session we went to have happy hour on a rooftop bar called the Monarch. From there we had a view of the empire state building and we stayed until the sun set and the empire state lit up green. This was a chance for us to talk more and get better introduced. I wish that I had more time with these people as they all seam so interesting and equally passionate about this work. This year’s fellows represent six nationalities! After the sun had set and our reservation ended, three of us decided to go up the empire state building. There was a bit of a wait but we were too busy chatting for it to really bother us. The view at the top was incredible. The view looked very different then when I had been up there more than ten years earlier! By the time we came down I was so exhausted I knew that I would not be able to accomplish anything else. Returning to my hotel room before 11 felt a bit anticlimactic, but I had a lot planned for the next day! Here is an article on the E4C website introducing the fellows. I’m looking forward to a summer full of learning about interesting products, collaborating with great people, connecting with other global development practitioners, and making some written contributions! Ready, set, go! From October 26th to 30th I traveled to Ann Arbor for the ACADIA 2016 conference. BeniAtlas was accepted as a project and I was still able to register as a student. I even received one of the student scholarships so that the only expense was the cost of traveling there. Because ACADIA was held in Ann Arbor this year I felt like I had no excuse not to attend! It also meant that I could visit and stay with my good friend Lauren who I lived with when I was in Congo and visited in Ann Arbor last year. I also got to meet her husband Ben. Once again I stopped at my parents place to pick up the van. Once again I left my passport in Toronto and had to go back and get it (so mad at myself!!)! Once again I dropped in on Katelynn and Mike in Windsor before heading across the border. This time I had no trouble at the border! Hooray for having a more official reason for traveling! I arrived at Lauren’s quite late but we still chatted for an hour or so to catch up a bit on life. I knew already that this time with her would be too short. Feeling very at home on what used to be Jon and Kate’s couch! I spent the next three days attending conference sessions and events. I will outline my favourite presentations/projects in my next post! On Friday evening Ben and Lauren took me out for dinner. After a long discussion (there are many good places to go in Ann Arbor), we ended up at Zimmermans, a classic deli that is famous for it’s incredible sandwiches. They were as good as advertised! We even stayed for dessert and I tried some delicious spiced hot chocolate. The next day I skipped the morning sessions so that I could spend a bit more time with Lauren and Ben. They took me for breakfast to Cultivate, a cafe/bar/community non-profit where Lauren used to work and where Ben sometimes offers free physics tutoring. Lauren went behind the counter and made me my first ever flat white (yes, please add another shot of espresso to my cappuccino)! I had such a wonderful time conversing with these two incredible people! Lauren was hoping to arrange a time to introduce me to Sush and Morgan, a couple who are friends from their church and have supported the work of the Congo Initiative. We didn’t hear from them and so started walking home, only to run into them on the way! So back we went to the cafe to meet and talk for a little longer! I learned about a small initiative called Neema (meaning Grace in Swahili) that they started along with Jon to provide start-up loans for small businesses in and around Beni, DRC. It goes to show how much you can love and serve a community even from the other side of the world! I went back to conference events for that afternoon and evening. We had planned to maybe go to a halloween party with Ben’s physics friends (Ben suggested we could dress up as the two up and one down protons that make up an atom…so awesomely nerdy lol! ), but the conference banquet went much later than I thought. Even though I didn’t arrive back at their home until close to 10pm, Lauren and Ben were still up for concluding the evening by watching an episode of Doctor Who! The following morning I joined them at Grace Church and then afterwards began the long solitary drive home. What a fantastic few days! The conference was inspiring and you will hear more about it shortly! From now on I am trying to separate my personal posts from posts relating to design or research. On the Victoria day weekend I went for my third time to the Adirondacks! This time I went with Matt, Leah, Neil, Benissa, Nate, Ali, and Amelia from Grace Toronto. Because it was so early in the year and we had an eight month old Hannah with us, we decided to do AirBnB instead of camping. We stayed at a spacious cottage in the town of Jay in the High Peaks region. Six of us carpooled down together in Nate and Ali’s mini van on the Friday evening and arrived at 1:30am. Matt and Leah had gone earlier then us and were already asleep when we arrived. They were ambitiously planning for us to be out of the house at 8am the next day because our plan was to hike Algonquin, the second highest peak in the Adirondacks. 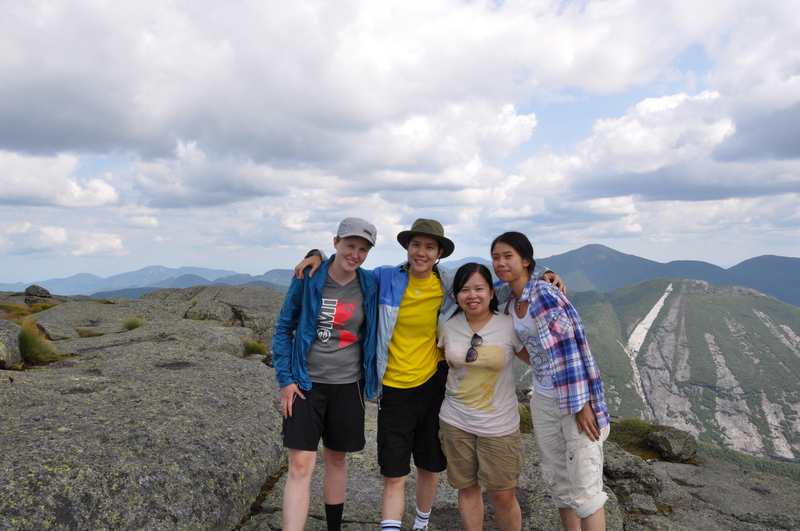 It is the same peak that I hiked last year with Vikkie, Rachel, and Jacky. An 8am goal meant we left at 8:30! There were so many hikers there for the weekend that the parking lot at the trail head was full! Matt wore a big carrier bag for Hannah, but she fell asleep in the first five minutes of walking and so they strapped her in a smaller carrier on Leah’s back. As a result we did a swap and Matt carried my small bag like a child in his bag while I took Leah’s bag. The trail up Algonquin looked quite different at this time of year. Most of the trees didn’t have full leaves and there wasn’t a lot of undergrowth. This meant you could see a long way through the trees and also take more notice that most of the trees were birch. We had not predicted how much ice would still be at the top of Algonquin, so we got to a point where we decided it would be safer to turn around. Luckily there was a fork on the trail where we could take only a short detour to get to another nearby peak called Wright (the 16th highest peak at 1,398m), that was low enough in elevation that it did not have any ice. The views were beautiful, but we didn’t stay up there long because we could see an oncoming raincloud in the distance! The second day we chose to hike Ampersand Mountain based on some feedback we got talking to other hikers the day before. 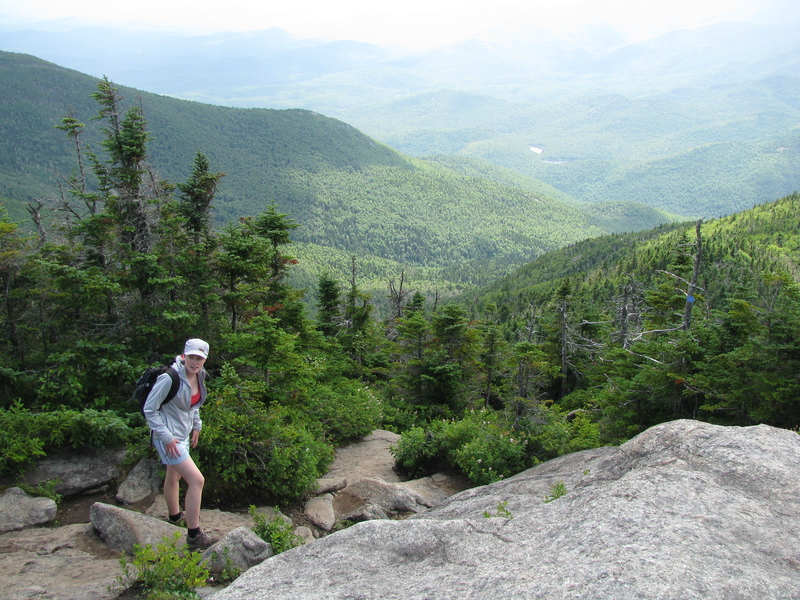 It was a much easier hike (Ampersand is not included in the high peaks), but was equally beautiful. We all decided the views were richer, perhaps because the other mountains around were slightly closer. The weather at the top was gorgeous and so we hung around up there for just under an hour! Everybody had a great time taking epic photographs such as child sitting on ledge (don’t worry… Leah is propping her up from behind…), or trying to spell ADK in the reflection of big puddles. It was so beautiful I didn’t have any other thoughts except for the magnificent view before me. I love hiking as a way to relax the mind because all you can do when mounting or descending a mountain is to focus on where to place your foot next. I definitely plan to keep doing hiking trips and maybe even do a two day trip! The final week of August I went to Ann Arbour to reunite for two days with my international “family” that I lived with for a three months in DR Congo and Uganda last fall. We got to know one another very well during that time because the insecurity led us to pray daily together, address deep questions, and make difficult corporate decisions. I was so excited to have this opportunity to see them all again, and all in the same place to boot! I came home to see my folks and pick up the van on the 23rd and then the following morning I drove to Windsor to spend the night with Mike and Katelynn (this is not before having to drive all the way back to Toronto because I forgot to bring my passport with me!). It was nice to be able to stop in on the way since Windsor is rarely on the way to anything. It was also nice to see Melody who has already grown so much and is adorable as ever! That evening I shared in a delicious BBQ that Mike and Katelynn hosted for the colleagues in Mike’s research group. The next morning Katelynn and I took Melody and went for a walk along the river where the Detroit skyline can be seen on the other side. Then I continued on my way to Ann Arbor. Every time I travel to the US there seems to be a good story. This time was funny because I got a full vehicle search including my bags. I guess a girl driving alone in a minivan might not be normal behaviour? The questioning went like this: “Where are you from?” “Toronto.” “Where are you going and why?” “To Ann Arbour to visit some friends.” “Where did you meet these friends?” “I met them during some time I spent in Africa.” Then I had to go on to explain what I was doing in Congo and that lead to the question of what I had been doing more recently in Nepal…. etc. etc. I should have just told them that I was going to check out the University of Michigan or something! Discovering that there is such a thing as fairy doors that are somehow a fad in Ann Arbor. 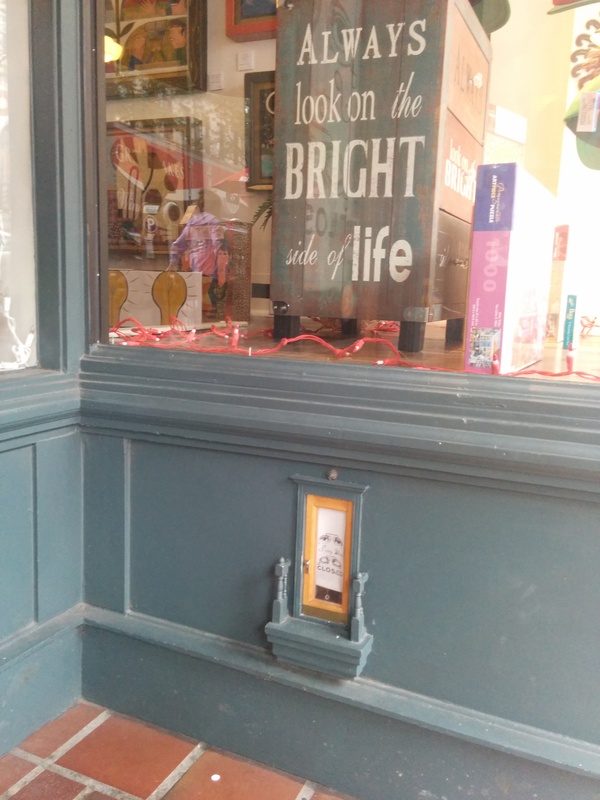 They are these tiny little doors that storefronts sometimes install and hide little trinkets for children to go and find. Walking the campus with Lauren and Jessica and visiting the architecture and music schools and catching up on life. Eating at a cuban inspired restaurant called Frita Batidos. I had a fish frita with tropical slaw and french fries on top, and a coconut cream batido (milkshake). Yum! 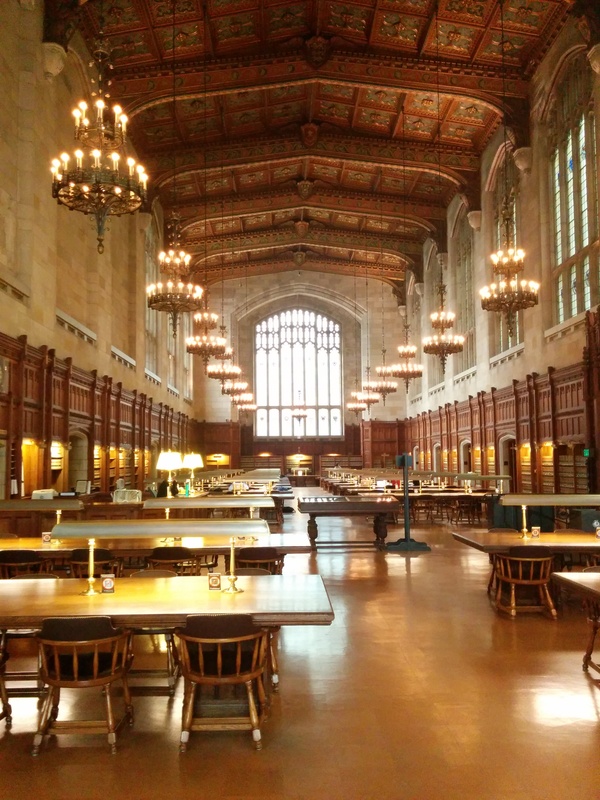 The legal research library at UofM. I wish UW had such inspiring spaces! In general it was just really great to catch up and see where everyone was at. It was also really cool to hear how the different projects are going with the UCBC community in Beni. In the eight months since I was there, the solar panels finally arrived (they were a long time coming), a business idea for a coffee company called Café Kivu became reality, and the Sharing the Land project (mapping land conflict) has taken leaps and bounds and is opening up to more partnerships and funding to increase the scope. It made me wish I was there to be involved in all of these exciting initiatives! On the morning of the 27th we said our farewells and I made the long drive home. One journey would move right into the next because the following day I caught a plane to London to attend my first ever conference! That will be for my next post! Fairy door?!? I want one! So I have to share this story because after the fact I can’t help but laugh about it and want to remember what happened. It all started when I was packing my carry-on suitcase at my parents house before leaving for Nepal. They both warned me that my suitcase might be too heavy. I shrugged them off because I had flown many times, and no one ever weighed my carry-on. Off I went on my journey from Toronto to Chicago, to Abu Dhabi, and finally Kathmandu. Everything went smoothly until I got to Chicago. Yup, all of my problems occurred in the US. I arrived very early to my gate because I had a five hour layover. They were asking everyone to go up to the desk to verify peoples’ passports. This is where I made my only mistake…. 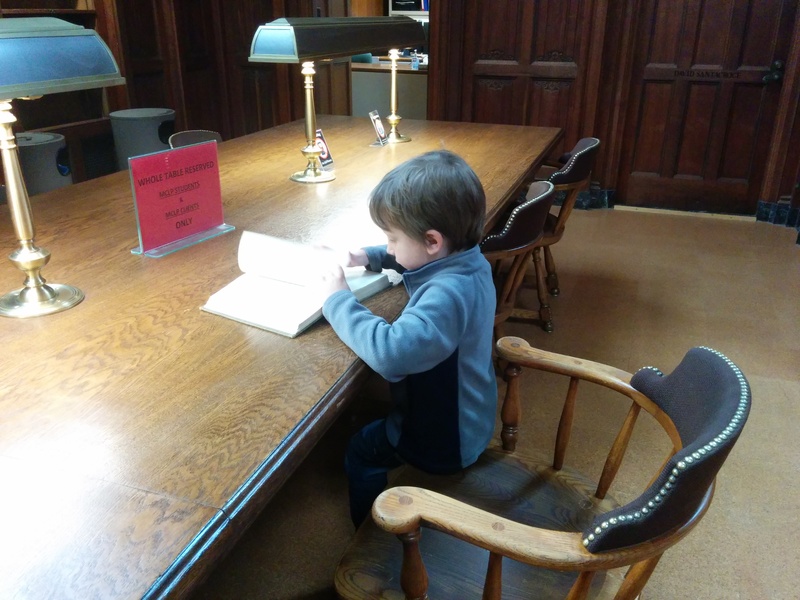 I went up to the desk…. early. I should have known that the clerks would be bored and would target me. They weighed my bag and low and behold it was almost double the meager 7kg limit. They told me I would have to check it for an additional fee. Luckily I knew I was allowed two checked bags (I’m sure they wouldn’t have informed me of this if I didn’t know). I asked them to please please reconsider because I was going to be doing disaster response and could not afford to loose the bag. The male clerk responded by saying that it would not get lost. I asked how he could be so sure. I transferred a few necessities from the suitcase into my purse, and grudgingly let them take it. Then I got to sit back down and watch bitterly as the gate got busier and they didn’t weigh anyone else’s bags that were certainly just as heavy as mine. Then I got on the plane to discover that the flight was far from full! Fast-forward to Kathmandu. There we were waiting at the baggage carousel and, low and behold, my carry-on suitcase was nowhere to be found! The following week was a lesson in patience and willingness to ask others for help and accept their generosity. Since the baggage claim folks in Kathmandu weren’t being very helpful, I called Abu Dhabi and, after a half hour of listening to the “sparkly” Etihad theme song, I finally got through and located my bag, which for some reason had not been loaded in Abu Dhabi. Even though it arrived in three days, I didn’t get it until a week later since we were away in Makwanpur for the field research. I borrowed shampoo, soap, hiking boots, a rain coat, a notebook, phone charger, and some drafting stuff! The rest of the trip went smoothly but on the journey home I had another, far worse experience. I think that I had food poisoning from something I ate on the first flight from Kathmandu to Abu Dhabi. In Abu Dhabi I was feeling queasy, but since we were flying to the US, instead of having time to rest we had to go through US customs and then a long line of security (if I had been flying to Toronto I would have avoided all of that). What made it worse was that there was no washroom near the customs and security queue. I had to walk 300 meters to get to a bathroom and then by the time I was back at the line I needed to go again. I’m glad that my colleague Dan had gone ahead of me in line at that point. I knew I was going to be sick soon and so I asked a nearby attendant if I could fast track through security some how. She said I had to go back to the far washroom. I didn’t have that much time. A few minutes later I puked on the ground in the customs line. I felt better for a little while and so kept going, but then puked again right before putting my suitcase on the security conveyor belt. It was so embarrassing! An attendant at security wanted to direct me back to the far washroom but I put my foot down and told him I had come all this way and I was going to go through security and go to the washroom that was immediately on the other side! After that I felt okay again. I didn’t feel bad at all about the mess because they deserved it for the poor airport design! Luckily I had some water tablets so that I could rehydrate myself. They wanted me to wait until a medical team came and checked me out, but no one came and so I left for the gate. Later at the gate the same attendant was there and he held my passport because he wanted me checked out before getting on the plane! The medical team was apparently too busy (I think there were other cases of people being sick) and so eventually they let me go after I told them it had been two hours since I was sick and I was able to hold down water. I’m so thankful they let me on the plane; I’m not sure what I would have done otherwise! I stuck to bread and crackers on the following flight and was fine. The next problem that arose was that I had a bout of restless leg syndrome that I get on rare occasions, usually because of low iron levels. I had never had it on a plane before though and it was horrible. I could not sit still for the life of me and so for the next sixteen hours I was shifting positions, doing stretches in my seat, standing up and walking up and down the aisle, and going to the lavatory for the sole purpose of doing squats. I am usually a big fan of window seats, but I am so thankful that I was on the aisle and had no one sitting next to me! Because of my restless legs I couldn’t sleep even though I was completely exhausted. It was the worst flight and longest 16 hours I have ever experienced! Finally we arrived in Chicago, and upon exiting the plane, who was giving directions for transfers but the same attendant who made me check my carry-on thirteen days prior. I wasn’t going to say anything, but he recognized me and asked how the trip went. I told him that my carry-on did not arrive and he said he was so sorry. As we walked away, Dan and I couldn’t help but chuckle. Dan commented on how this was the moment of closure for the whole saga. I am thankful that despite the terrible air travel experience, I made it to and from Nepal safely. This experience gets to be added to my suite of memorable travel stories! This past weekend I went for the second time to the Adirondacks in New York State. I went last year with a group of friends and probably talked about it too much because my friends Vikkie and Rachel had it in their minds that I should take them there this summer. 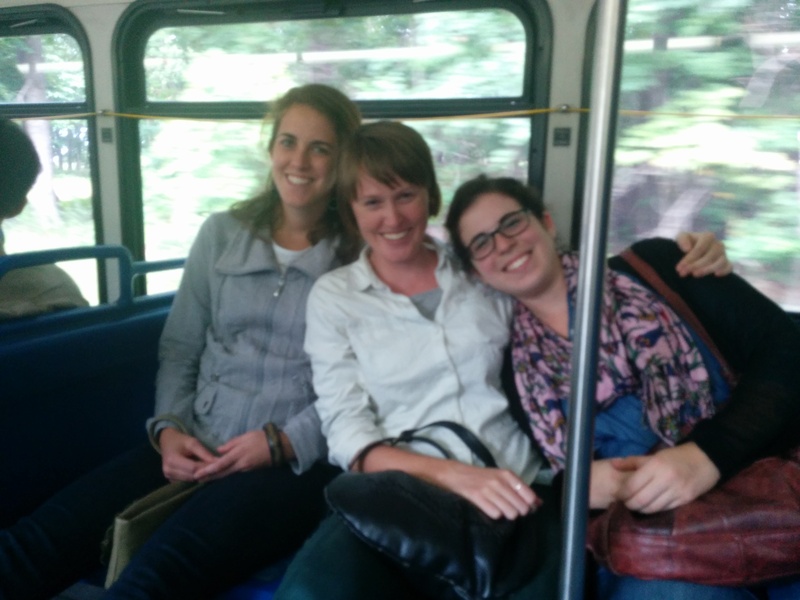 We went with the same group of girls who did a canoe trip together last summer: Vikkie, Rachel, Jacky, and myself. Because I had been there before I had the fun job of selecting where to camp and what hiking paths to take. I decided that Wilmington Notch was probably the cheapest place to camp and selected trails that were described as being challenging but still okay for “out of shape” hikers. I didn’t really know what that meant but I decided we could try it out and change plans if necessary. We drove down on Friday and had smooth sailing the entire way. We even had time to stop in Kingston for a nice lunch on the water followed by ice cream. I was a bit anxious about crossing the border because I had to travel on my dutch passport because my Canadian one was in processing for a Congolese Visa. I have discovered that being a dual citizen has its benefits! For the first time ever we had to pull over at the border crossing and I had to go inside to fill out papers for a Visa waiver. Luckily there was no border wait and we were on the road again in no time. 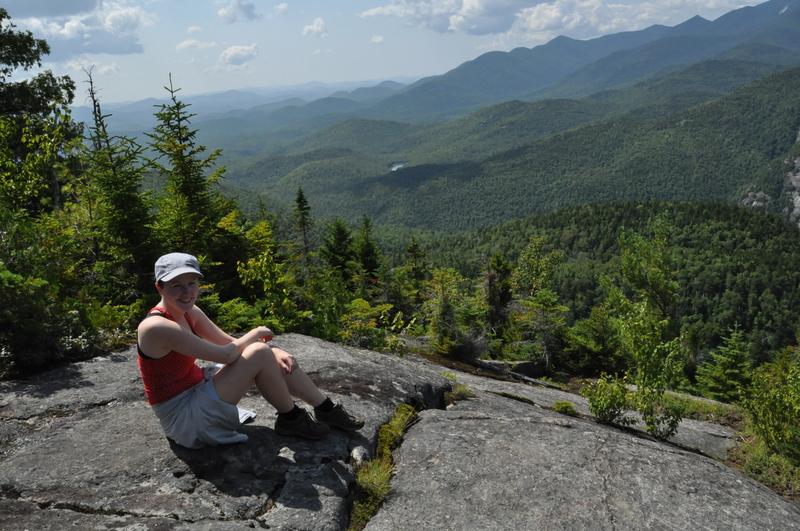 On Saturday we hiked Giant Mountain, the 12th highest peak in the Adirondacks. We took the primary trail from Chapel Pond and it was six miles (9.7km) round-trip that took us seven hours. The ascent began right from the car until the summit and we found it quite challenging. The first part of the path was very rocky with a steep ascent where we often had to grab on nearby rocks and trees to pull ourselves up. The first view we got looked down on what we thought was the “Giant’s Washbowl” that looked like it had a beach and road access. From that point on we dreamt of swimming in the refreshing water after the hike! We later discovered that it was actually Chapel pond that we were seeing, just a step away from where the van was parked! The second portion of the path had long stretches of slanted rock face that opened up to continuous views. It was kind of cool to get the same view again and again, but each time higher. Eventually we couldn’t see the pond or road anymore but could see above and then further beyond the adjacent peaks. The trail was busy and at the top we joined a substantial group of people who were chilling and enjoying the view over lunch. It turns out that outdoorsy people are also dog people because I’m convinced there were more dogs on the mountain than people. The descent felt much faster than the ascent but by the time we were done our muscles were exhausted. I think that this first day was bit of a revelation for us of what climbing a mountain actually takes! Even though we were tired nothing would stop us from a refreshing swim after the hike. It was beautiful to swim surrounded by the trees and hills and felt amazing to let our limbs be weightless for a time. Getting out of the water after was a bit difficult! Even though we probably could have turned in early, we decided that camping wasn’t camping without a cold beer (Leffe to be precise), a fire, and some smores. On Sunday we woke up even earlier because I had planned an even longer hike that needed an earlier start. We were very stiff and sore but even though I offered the suggestion of doing something easier, the others didn’t want to give in and so off we went to conquer mountain number two. We hiked Algonquin Peak that is indeed the second highest peak in the Adirondacks. Even though we had done a previous day of hiking, the ascent felt quite fast. We all agreed that we thought the second day was easier, even though we learned later that the climb has a higher level of difficulty. My theory is that we just toughened up as time went on! On the way up Algonquin there is a side route that leads to Wright Peak, the 15th highest peak. Since it was only 0.4 miles out of the way we decided to go for it and aim to summit both. It took longer and required more energy than we thought, but the top was worth it! Unlike Giant that was limited to a view in one direction, the top of Wright was bald and had 360 degree views. Another thing that was awesome is that we were completely alone except for one guy who was chilling out a ways from the summit. The only problem about ascending Wright was that we saw Algonquin looming large and far in the distance. Some doubts passed through our minds of whether we had the energy to get there. We had summited a peak and that was good enough, right? Nope. We had to go for it or we knew we would regret it later. So off we went. We descended Wright (which thankfully felt fast) and began the last 0.9 mile ascent of Algonquin. The climb became much more technical by that point with very steep sections of rock, but somehow we made it! The top of Algonquin was much busier with people and so we were glad we had time alone on Wright. The views on Algonquin were even more spectacular and we chatted for a while with a ranger who told us a bit more about some of the rare alpine plants that grow on a few of the tallest peaks. The descent felt loooooong, especially the final few kilometers that had felt so fast that morning. In total we hiked 9 miles (15km) in 9 hours. It was dusk by the time we approached the car. The parking for hikers was nearby the Adirondack Loj and so we decided to check it out. We discovered that the Loj was on a lake with a private swimming area. Even though we weren’t supposed to, we went swimming there anyways. Afterwards we parked on an empty campsite and prepared a dinner of pasta since it was our plan to go check out Lake Placid without stopping first at our campsite. In town we wandered the main street and explored several interesting shops. We didn’t last as long as we thought we would and were almost stumbling down the street. We went to the campsite and went straight to bed. Even though we intended to sleep in, some obnoxious birds woke us up early. We took the morning nice and slow though. By late-morning we packed up camp and headed to our final destination – Whiteface Mountain – the 5th highest peak that actually has access to the summit by car and elevator. It was fun to play tourist even though it cost thirty dollars to get in. The access road wound its way up the mountain and parking was a single row along the road after a cull-de-sac. From there we had the option of either taking the elevator up the final 27 stories or taking a curated trail up to the summit. We took the trail that had magnificent views the whole way. The top of Whiteface was flooded with people. We saw that there were still hikers who had come up on foot and joined the crowd at the top. I got talking to a Belgian woman who had driven up with her grandkids and were waiting to meet up with their parents who were hiking up to meet them. We also coincidently ran into the man we had met on the top of Wright Peak. We descended by the elevator so that we could experience the tunnel. You could tell the elevator and tunnel were old and the tunnel was very chilly. On our drive back down the mountain we pulled over at an overlook with a picnic table and enjoyed a final lunch of noodle soup. We sat four in a row on one side of the picnic table so that we could eat and enjoy the view. From there we began the long drive back home. We arrived at the border quite quickly and of course I didn’t even have to get out of the car this time. Thanks Canada for making me feel welcome (although they didn’t stamp my passport :P)! Unfortunately we got stuck in quite a bit of traffic on the 401 because of construction and didn’t make it home until almost midnight. We stopped for dinner at a pub we knew had a Monday night wings special and had to stumble into the restaurant after sitting so long in the van! – While stuck in traffic I told the others that I felt like running alongside the car for a while kind of like a Chinese red-light. Turns out they didn’t know what it was and so we preceded to look it up in the urban dictionary to prove I wasn’t making things up.